I take my latest interactive version of Dao Gives Birth to One (version IV) (2012) as an example to demonstrate how to extend the concept of ‘play-appreciation’ through extending the role of the audience. First of all, I have created two entrances / exits with a tunnel for the audience in order to provide them with a sense of cycle, or never ending viewing experience . I created a tunnel with openings in two directions (one on the right, and the other on the left) which serve both as entrance and exit, with dim lighting, in order to correlate the concept of the cycle from the installation – which is that there is no end or beginning of the audience’s visual journey. So they can choose to navigate the artwork either from the left or right hand side. 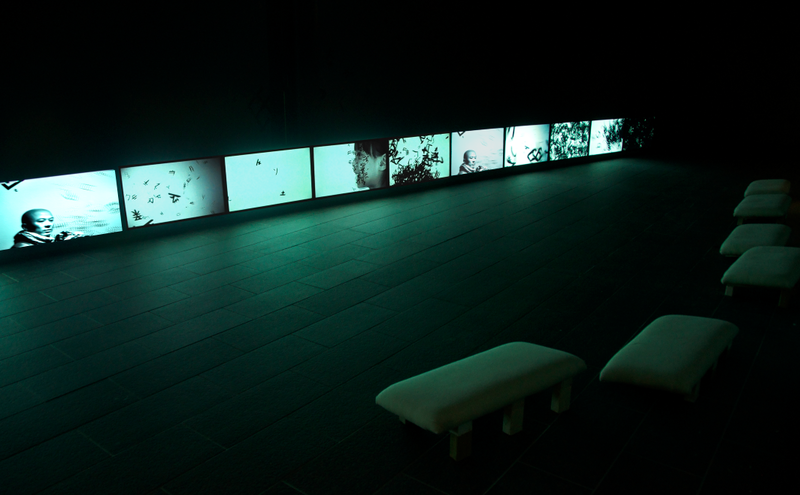 Secondly, I put the 12 monitors onto the floor of the exhibition venue rather than hanging on the wall. At the same time, I designed and custom-made six sets of rectangular shaped cushions – soft seats, with sackcloth (hessian) material in order to provide a comfortable and cosy feeling to the audience, allowing them to sit or lie down in front of the artwork (see Figure 197), in order to create a sense of proximity and three-way intimacy . Thirdly, I allocated four screens (out of the 12) as real-time interactive with the audiences in this cosy environment. Thus, on the one hand the audience can simply enjoy the spiritual atmosphere created by the video installation through viewing the movement of the flying characters. On the other hand, they could also act as participants, merging into the virtual space and interacting with the flying Chinese characters. Three-way intimacy: (1) the artwork; (2) the audience viewing the artwork and interactive screen; (3) the audience playing the interactive ‘FACC’ in the screen. Furthermore, I organized a public lecture and workshop (see Figures 198 – 200) for the audience a week after the opening of my solo show ‘Hung Keung: Dao Gives Birth to One’in the Chinese Art Centre, Manchester, UK (2012). First of all, in the lecture session, I first introduced and demonstrated how the concept of multiple viewpoints is applied in Chinese characters, and how Chinese characters are closely related to the human body and to objects that are themselves related to the human body. Then in the workshop session, I invited the audience to create their own text base of the philosophy of time and space in relation to Chinese characters. Afterwards, I took another two weeks to digitalize all their drawings into animated texts, and then programmed and integrated those new texts into my interactive artwork. Then all the audiences were invited to come back to the exhibition venue to play with their ‘artwork’. The response of the audience and the public was very positive. In this new direction, I attempted to extend the meaning of ‘participant’ from someone who plays an artwork through interaction to someone who creates their own artwork with the artist. Thus the audience was no longer passive as an audience but also actively engaged in the creation of an artwork and then as playing with their own artwork (see video documentation in Appendix D in DVD ). Most importantly, audiences went through various steps: visiting the exhibition, attending the lecture, participating in the workshop, revisiting the exhibition – which together constituted a new and innovative platform of ‘play-appreciation’ connecting old and new experience with respect to the traditional concept of Chinese art and modern digital practice. Title: HUNG Keung: Dao Gives Birth to One; Venue: Chinese Arts Centre, Manchester, UK; Date: 5 July 2012 – 1 Sept 2012.